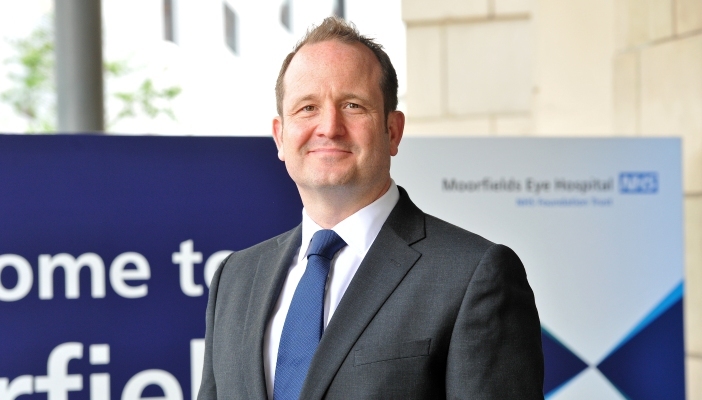 In an exclusive interview Hannah Adams speaks with David Probert, the new CEO at Moorfields, on his role, preventing sight loss and his favourite biscuit. It’s a dreary Thursday morning in early June and the new CEO of Moorfields Eye Hospital starts his day with an intense -strength coffee handed to him by his PA, Heather. With 18 years experience of running NHS hospitals under his belt, David Probert is in the middle of his seventh week in the job. “You wouldn’t have known it was the second day of summer, would you?” David laughs. The weather had been particularly miserable so far that morning. By 9:00am a blanket of grey cloud covers the sky. So how is he getting on? On my way to the interview that morning, I had noticed the staff saying “good morning” to each other and to patients. “It’s a very friendly, welcoming environment,” he explains. Since starting at Moorfields, no two days have been the same. David wants to visit every service offered across Moorfields’ 32 sites (including two satellite sites in the Middle East). David is familiar to working in hospitals that have a strong association with academia as well as service delivery. He’s confident his experience of running hospitals that blend the challenges of research and development with managing a service can benefit Moorfields in the future. David worked as the Chief Operating Officer at The Royal Marsden and was Director of Strategic Development at University College London Hospitals’ collectively for over eight years. Both are renowned for having strong academic environments. “It’s very different to just a service-led organisation. At any one time, Moorfields and its partner university hospital, University College London is involved in around 100 research projects. A high profile 10-year project led by Moorfields and the Institute of Ophthalmology has been looking at restoring vision using stem cell transplantation technology. A number of patients have been involved in the trial with the results due to be published later this year. “Education is an area where we have a very proud history here. At least half of the UK’s ophthalmologists have come through Moorfields for some kind of training, so we’ve got a really important role. But we’re probably not delivering as wider set of education as we should do. And so that’s something for us to consider more widely. Another education-related area he’s interested in is preventing sight loss. “We haven’t had a massive role in prevention. We’ve got public health teams here and we’ve tried to influence national and international policy." The CEO is no stranger to the pressures felt by hospitals. This year, eye clinics have been pushed firmly into the spotlight due to the increased demand in appointments from an aging population. “It’s a huge challenge. Last year, we saw 105,000 people coming through our A and E, a year-on-year rise of six to eight per cent. What we can’t do is get bigger and bigger and bigger because it’s not affordable and you’d end up having urgent eye centres everywhere which would diminish the quality of the care provided. “One of the most important things to move us forward with delivering care is how technology allows us to deliver more virtual care. A patient group was talking to me around wanting to use their iPad technology or tablet technology to make their own assessment of their well-being and then sending that to somebody who can then decide whether or not they need to come into the hospital. Technology is a real enabler potentially to help us." As the conversation begins to wrap up, one of the last questions is about the deadline for the Accessible Information Standard that’s due to come into force at the end of July. The standard will make sure blind and partially sighted people will be able to have medical information in a format they can read. Will Moorfields be ready for the standard deadline in July? As well as revealing his favourite biscuit (Oreo), one lasting thing David mentions is the relative cost saving early prevention work could have to families and individuals who currently have to support their loved ones with sight loss. Find out the latest news from Moorfields Eye Hospital.